On Tuesday, Ma y 23rd, the LPC denied a revised proposal brought before them by the owners of the Hopper-Gibbons House, a landmark which is part of the Lamartine Place Historic District. The district, a trim collection of twelve landmarks whose residents were instrumental in NYC’s history–perhaps most notably Abby and James Sloan Gibbons who were active abolitionists in the Underground Railroad, and their neighbor, Isaac Hopper, who was a leader in Prison Reform. 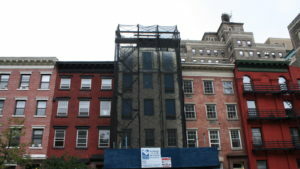 The landmarked home, at #339 West 29th Street has been the subject of an ongoing battle. A non-approved rooftop addition occupied the roof where the family once fled across neighbors roofs to safety when confronted by an angry mob during the Draft Riots of 1863. Attorney Michael Hiller, recent HDC Grassroots Awardee and lead counsel for the Central Park West Neighbors Association and other neighborhood groups argued against the previous approval and was part of the public outcry against this new revised proposal. We applaud the LPC for sticking to the importance of this landmark, and its intent. The full proposal is linked above. A close read will note that there are no mock ups to see of the proposed addition because the extant illegal addition is in the way! The DOB has issued an emergency declaration for the removal of the illegal floor. Further coverage via YIMBY, and CHELSEA NOW.